The Kverneland NG-M 101 is a medium sized power harrow for tractors up to 140 hp, built following the same design concept as the well known “H 101” and “S 101” models. The Kverneland Power Harrows are designed for heavy conditions. Special emphasis has been given to reliability and a strong trough design. This has been achieved by having a large distance between the conical bearings, hardened gears in the trough and a heavy-duty rigid trough design. Robust, self-supporting trough design providing the necessary strength for trouble-free operation. Tine shaft of 50mm with two large conical bearings with a wide distance providing rigidity and a long service life. Robust and reliable headstock for easy connection to all tractors and the attachment of heavy seed drill combinations. Tine dimension: 15 x 320mm. For optimum performance in difficult soil conditions, the robust trough design provides a large clearance between the tine holder and trough bottom. This allows large amounts of residues and stones to pass freely without blocking and provides excellent results in mulch conditions. NG-M 101: A 5mm profiled plate together with a 5mm top plate form the 120 x 400mm trough. In combination with a 10mm reinforcement plate, precise positioning of the rotors gives a light but strong bending resistant trough. H series: Two profiled 6mm plates ensuring precise rotor spacing, high bending resistance in the 140 x 400mm trough. NG-S 101: Two 10mm profiled plates forming the 150 x 400mm trough. The fully welded rotor housings add additional strength and bending resistance to the trough. The “Pro-Fit” Active tines ensure optimum penetration in hard soil. The tine, due to its shape, pulls itself into the ground. This gives a constant working depth and also prevents the machine from lifting out of the ground in hard dry soil conditions. It creates additional recompaction at the packer roller. The “Pro-fit” active tine lifts the material and pushes it in front of the power harrow. This gives an optimum levelling effect even in tractor tracks. In mulch conditions the active tines can work directly into stubble and hard soil. The special shape of the tines keeps residues on the surface and this gives a big advantage against erosion. Helical tine positioning in order to prevent damage caused by stones and to ensure even levelling. This reduces also peak loads on the driveline and results in smoother running and less fuel consumption. The quick-fit tines for easy replacement and carbide tines for a longer lifetime and minimum wearing are available as an option. Down time can be minimised by optional carbide layered Quick-Fit tines. These tines ensure a long lifetime and minimum wearing even in tough and abrasive soils. 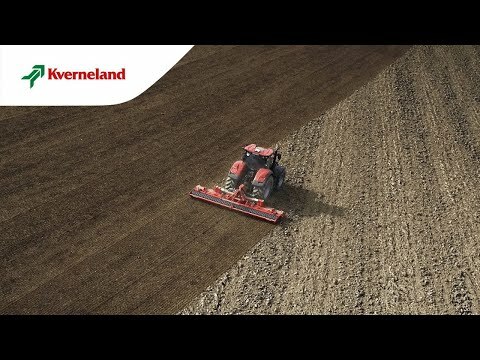 The Kverneland range of rollers offers the right choice for all various soil conditions and crop establishment systems.